Although Spring is "technically" here, I've definitely had my fair share of rainy days this month, living in the San Francisco Bay Area. With the help of my lovely friend, co-worker, & fellow blogger, Stephanie of StephanieJadeWong.com, I'm here to share one of my favorite rainy day outfits. To contrast the grey, gloomy weather, I love adding some color to my day using my outfit. This NY&Co. houndstooth coat is an absolute favorite of mine, and it's definitely a closet staple that I plan to keep for years to come. It's made a comeback every Fall and Winter since 2010. 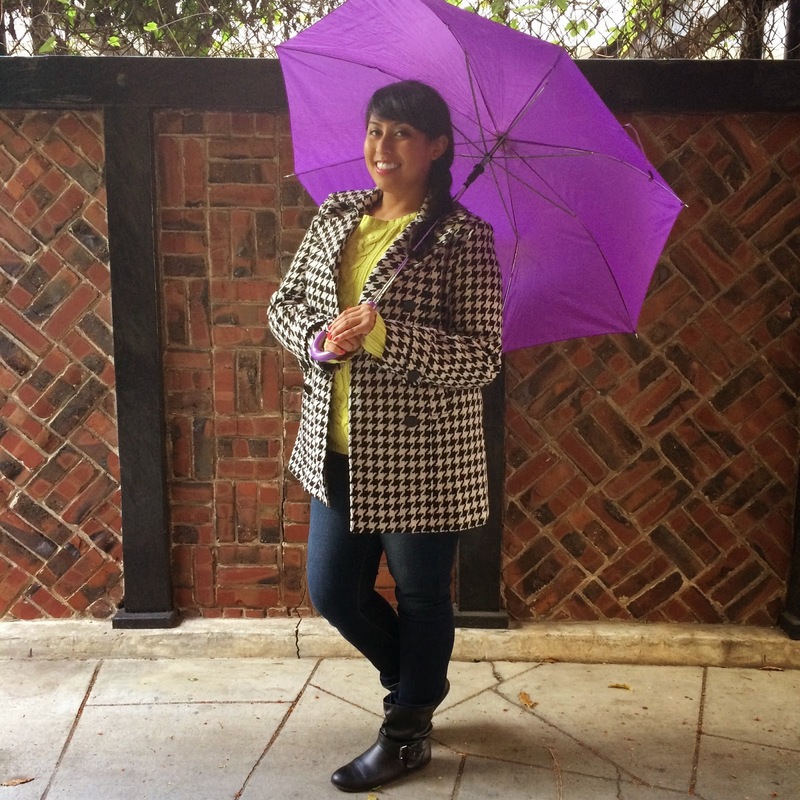 I love paring classic, neutral patterns like the houndstooth of my coat with bright pieces! 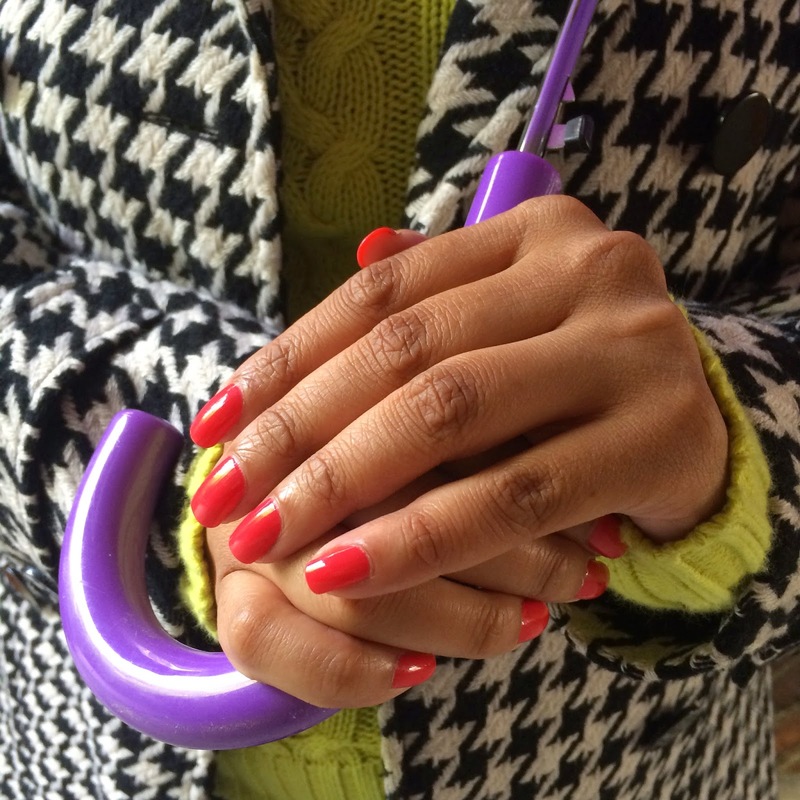 My sweater, umbrella, & nails add that wonderful, colorful splash that I need to get through a rainy day. The bright colors also help allow this outfit to transition from Winter to be suitable for those early springtime showers. My bright citron sweater is from Old Navy. 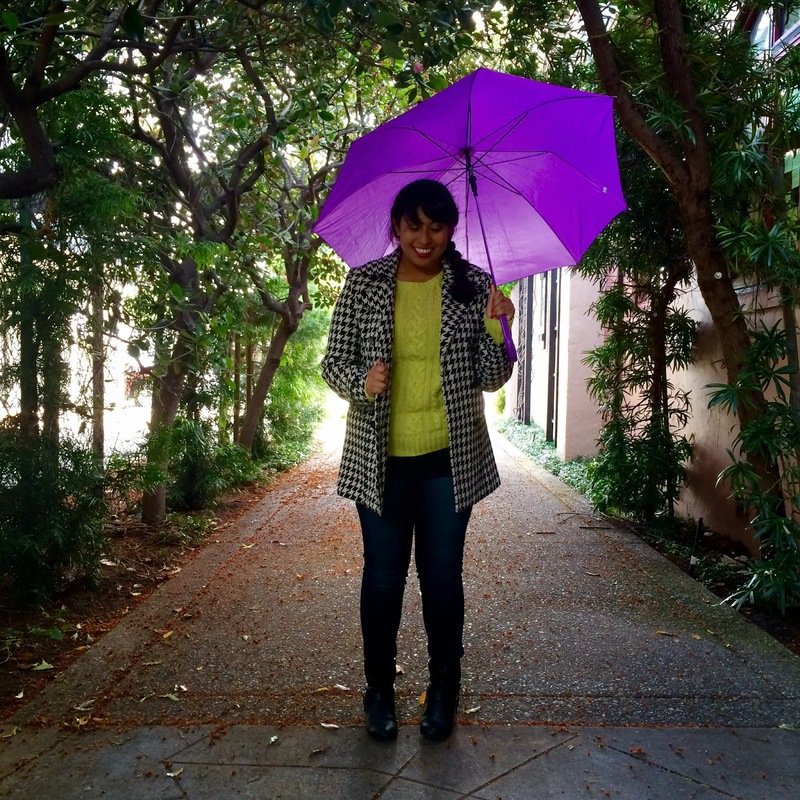 My purple umbrella was a gift from my mom, but you can find a similar one here. My bright, coral nail polish is by Essie - Peach Daiquiri. Are you an ipster yet? As a lover of all things Beauty, constantly searching for the latest and greatest skincare, haircare, and cosmetics can get very expensive. When it comes to purchasing new products, quality is tremendously important to me. Though I’m more than happy to spend more money on great products, I’m definitely more inclined to finding the items that give me the most bang for my buck. This is where ipsy comes in! With so many products out there, ipsy allows me to nurture my love of discovering new Beauty products without burning a hole in my pocket. The generously sized samples and full-sized products I get in my monthly ipsy Glam Bags allow me to fully test out the products. These are certainly not free, foil packet sized samples that only allow for single use. Each month, ipsy features a new Glam Bag with 4 to 5 deluxe sized Beauty samples and at least one full-sized product, all in an awesome, ipsy-exclusive makeup bag. 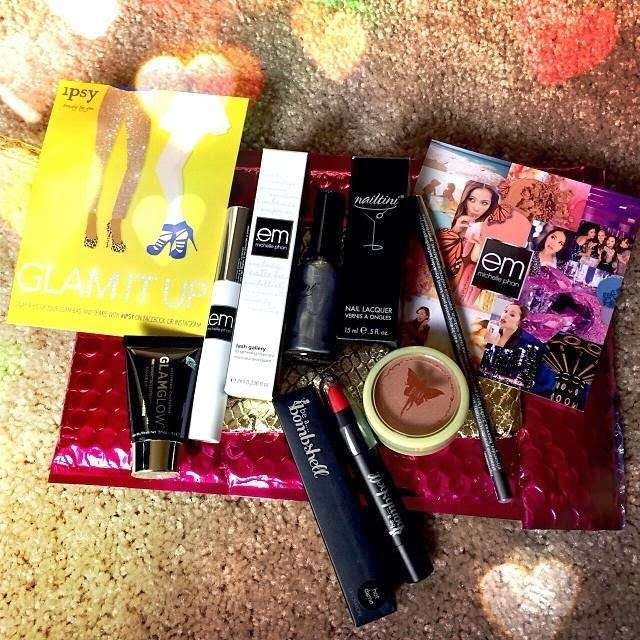 My Glam Bags have featured samples from well-known brands, such as Urban Decay, bareMinerals, and Tarte, as well as newer, small, upcoming brands. After finding the products that I love most in any given month, I love how ipsy offers special discount codes on ipsy.com as well as in a monthly Glam-a-Gram email. This way, I can buy the full-sized products at more reasonable prices. Sometimes items I have my eye on are even included as awesome ipsy Offers, amazing promotions from the brands previously featured by ipsy, that are available in limited quantities and are launched every Tuesday, Wednesday, and Thursday. Though ipsy is about trying new things, ipsy uses a personalization tool called ipsyMatch to find the best bag combination for you out of the products available for the month. When you initially sign up, you take a Beauty Quiz to record your Beauty preferences and physical attributes. Using your Beauty Quiz answers and feedback given on your Glam Bag on ipsy.com, ipsy is able to choose the products that will make you happiest. So if you’re not an adventurous Beauty sampler like I am, rest assured that as time goes on, retaking your Beauty Quiz and reviewing the products your receive can only improve your items chosen by ipsyMatch. When you share your love of ipsy with the Beauty lovers in your life, you’re rewarded with awesome bonus goodies. The ipsy Points program allows you to earn Points for referring friends and family, as well as sharing your Glam Bag goodies to your Social Media Channels. I’ve gotten a great deal of referrals and have earned enough Points in the past to redeem for several bonus items included in previous Glam Bags. Needless to say, I love everything about ipsy, from the awesome monthly goodies to the fabulous community of passionate Beauty loving ipsters. But don’t just take my word for it, you need to try ipsy for yourself! For only $10 a month, there’s not much to lose. With the full-sized products I’ve received in the past, I definitely feel that every bag I receive is always valued at way over $10! So what are you waiting for?! Sign-up today!